An invitation to Bring Your Own Z Scale Layouts under your arms! 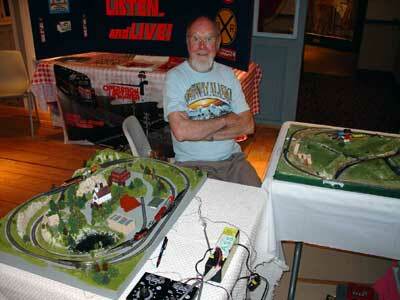 Not everyone is interested in modules or has the desire to spend an entire train show running trains. We have come up with an event that might encourage people to demonstrate their Z scale skills. At most of our shows, we have set up an area called “BYOZ” or “Bring Your Own Z”. This area has standard 8’ tables to display and run “carry in” Z scale layouts. We supply the tables, power, and manage the area. Here’s how it works…. 1) Bring your layout with you to the show…suitcase, pre-formed, custom, whatever…just limit the size to something you can carry into the show…up to 2’ x 4’ and be able to set on a table top. 2) We provide a space for you on a “first come, first run” basis. Come in anytime during the show and stay as long as you like. 3) We limit operations to 2 hours if there others waiting. Depending on how many people show up with layouts and trains, we could have a number of layouts running at a time (2 per 8’ table or even more with smaller layouts). If nobody is waiting to display, those already displaying can stay as long as they want. 4) We do ask you to stay and run your layout while on display. We have found that people are most interested when there are trains running and “little fingers” tend to only “attack” trains that are standing still! 5) Our club members have small layouts that will be on display and running when there is no one else showing. 6) We will provide stanchions and ropes to keep a little distance from the layouts. However, you will be responsible for your own layout and trains. You don't have to a member of the club to participate in the BYOZ...just show up! We have tried this system out shows around the local area since 2003. 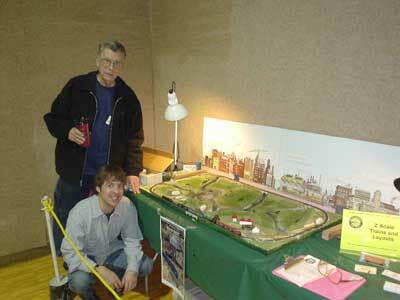 The club has showed Z Scale at shows that didn’t have the space for our modules this year using BYOZ tables. We also found that one club member can run a show, with other members coming and going with their layouts and trains when they have the time. 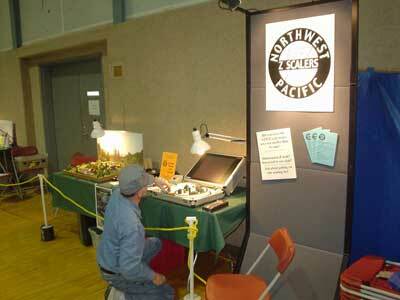 During the NMRA NTS 2004 in Seattle, we had a number of our-of-town folks running their layouts. If you are interested in more information, let me know…or just show up at the BYOZ area when we post on our home page. For more pictures of the Northwest Pacific Z Scalers modules and BYOZ shows, point your WEB browser to http://www.tomgtomg.com/z.